Ford's Kansas City Assembly Plant in Missouri is expanding in a big way. As the company works towards its goal of creating 12,000 new jobs in the U.S. by 2015, the KC plant will put more than 2,000 new jobs towards that goal this year. Ford will have invested over $1.1 billion dollars into the Kansas City plant in tooling and building additions as they expand its operations to include a new three-wet paint shop and put the finishing touches on a huge new stamping facility on-site. Over a thousand of the added jobs Ford will be putting online this year will be new hires with the rest being reinstatement of former jobs. The additional jobs created will put Ford at 75 percent of its goal of 12,000 new hourly jobs by 2015. The new jobs will also mean a big boost to the local and national economy. The KC plant has over 250 suppliers around the nation plus ten directly in the Kansas City area. Those suppliers are gearing up to increase production based on projections of demand from the third shift Ford will be putting online late this summer. The new assembly lines and stamping added for the new Ford Transit commercial van at the plant will mean even more work for those suppliers. Six of the suppliers Ford has in KC will be expanding and adding new jobs to meet the increased demand. Ford estimates that more than 18,000 jobs outside of the company will be added over the next two years as a result of the Kansas City plant expansion. 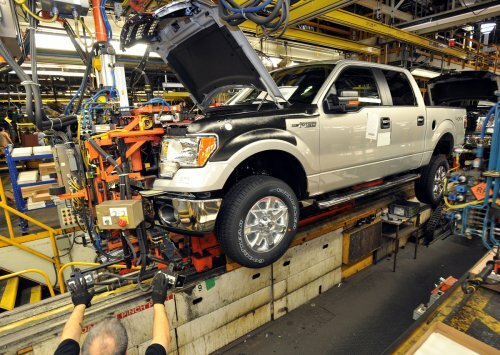 The Kansas City Assembly Plant builds the Ford F-150, the nation's top-selling pickup truck, in its Regular, Super and Crew Cab iterations. Starting this fall, it will begin production of the 2014 Ford Transit commercial van as well. Already employing 2,450 hourly workers, the plant will add another 900 this summer to make up a third crew for the F-150 and the other 1,100 this fall to produce the Transit. F-series sales have been up 24 percent in April and 19 percent year-to-date. The full-sized truck segment is growing at three times the rate of industry passenger car averages and is this year's fastest-growing segment by far. Ford is investing over $6.2 billion in its U.S.-based automotive production facilities and a total of $16 billion in its U.S. operations overall.